Directorate of textiles, Government of Maharashtra, Nagpur-440001, is established in the year 1971. The Directorate is a entity of Co-operative, Marketing & Textiles Department of The Government of Maharashtra, It works for cooperative textile industry. Director (Textile) is ex officio registrar for co-operative textile societies. The directorate also works for the implementation of the various schemes for co-operative spinning mills, power loom societies and handloom societies. Working of the Directorate is regulated by the Maharashtra Co-operative Societies Act 1960 and various rules of Government of Maharashtra. 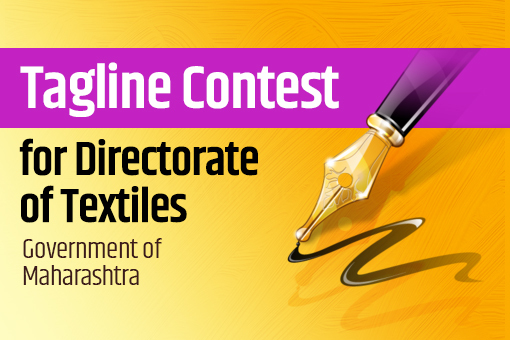 Directorate of textiles, Government of Maharashtra, Nagpur appeals the citizen to participate in the competition in large number. Last date for the submission of entries is 20.01.2019, 5:00 p.m.
Total Submissions (	1037) Approved Submissions (0) Submissions Under Review (1037) Submission Closed.